Reigning UFC flyweight king Henry Cejudo says Khabib Nurmagomedov’s strength lies in internal as well as physical attributes, and that he will bring his formidable survival instincts into the cage when he faces Conor McGregor. Lightweight champion Nurmagomedov meets McGregor in Las Vegas at UFC 229 on October 6, in what has been billed as the biggest fight in MMA history. The Russian, who is 26-0 in his professional MMA career, will come up against Irish megastar McGregor, the first man to simultaneously hold UFC championship titles in two different weight divisions – including the lightweight belt, now owned by Dagestan native Nurmagomedov. Speaking on the sidelines at UFC Fight Night in Moscow at the weekend, flyweight champ Cejudo was asked about what makes Nurmagomedov special. “I don’t even think it’s something physical, I think it’s something internal that drives the physical,” Cejudo said. “I think his determination, his background, where he’s from, if you guys go where he’s from… it’s literally survival, he brings that into the cage, he brings him, his country and his culture into the cage, I think that’s what makes him dangerous,” the US fighter added. The flyweight champ warned that McGregor’s range would pose a considerable threat to the 29-year-old Russian, but added that Nurmagomedov could make the fight “a grind” for his rival. 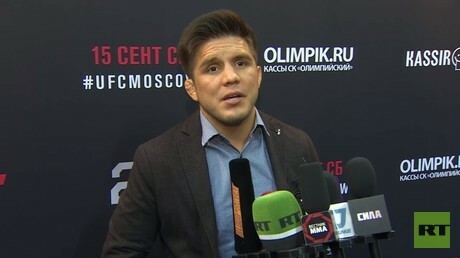 When asked about what advice he would give Nurmagomedov ahead of the fight, Cejudo also said that “composure” would be key to the Russian’s chances of success against McGregor, who stands at 21-3 in his career. “I’d tell him composure, I would stay calm, I would find the right timings, just like Conor would… put him on his back, put him against the cage, and grind him out, but it’s a tough fight for him. Cejudo himself shocked the MMA world with his decision victory over Demetrious Johnson at UFC 227 in August. The 31-year-old Los Angeles native was planning on taking his belt with him to the Russian capital for the UFC’s first event in the country, although it was lost in transit. The fighter also suffered the loss of his Olympic freestyle wrestling gold medal, won in 2008, when he was forced to evacuate a hotel during the California wildfires of 2017. “It’s the memories, it’s the legacy that comes with being a champion. I’m going to get a gold medal back, I’m going to get a belt back. But it’s the memories that come with that that makes it special,” he added.